Postepay is a digital payment system that employs rechargeable pre-paid debit cards and is available to Italian residents only. Developed by the Italian Postal Service, Postepay is designed to provide customers in the country with a simple and convenient method to make online purchases or pay for different services on the web. Although Postepay is fairly unpopular and limited to Italy-based users, it offers quite a few advantages to those who are able to acquire it. Customers of Poste Italiane, or the national Postal Service, receive plastic or virtual pre-paid Visa, Visa Electron or MasterCard cards when they sign up for the service. With them, they can easily shop online, pay their bills, or top up their balances at their preferred online casinos. An increasing number of web-based gambling providers are already accepting Postepay as a payment method on their sites. Players can use it not only to make deposits but to also withdraw their winnings from more than 30 online casinos. Despite the fact that the service is relatively new, it can function in many more casinos without being specifically mentioned. In this case, Postepay may work as Visa or Visa Electron. This new, Italy-based payment method offers high levels of security as Postepay users do not reveal any personal or financial information online. Postepay is a Visa/MasterCard pre-paid card service provided by the Italian Poste Italiane. Unlike most of the other pre-paid cards, it does not require having a bank or checking account, because cards are issued and serviced directly from the Post Office. There are several types of Postepay cards, digital and plastic, and all of them can be loaded with funds, when necessary, at the nearest post office or ATM. Other ways for recharging your Postepay card include through SISAL kiosks or mobile phone SIM cards (PosteMobile SIM cards, which are synced with your Postepay account. Postepay cards can be used at hundreds of land-based and online merchant stores and POS terminals in Italy and abroad. They are accepted almost anywhere Visa and Visa Electron are accepted even though no Postepay sign is specifically displayed. In many cases, the Postepay digital cards work in websites and online casinos where MasterCard is accepted. One of the biggest benefits for Italian users who choose to make payments through Postepay is the fact that the cards can be used for cash withdrawals from ATMs, as well. Signing up for the Postepay pre-paid card service does not require linking with a bank account. In order to apply for an account, you need to provide your ID and Italian tax identification number at a post office or online, at the Postepay official website. You can purchase one of the plastic Postepay cards for €5 and then activate it on the website. Issuing digital cards is free of charge and each user can own up to three Postepay cards. Loading Postepay plastic or digital cards with funds is very easy and can be done at any of the 14,000 post office locations across Italy or at roughly 4,500 ATMs. You can choose from cash payments, transfers from another Postepay card, using Maestro Postamat Bancoposta, or simply by paying via Visa, Visa Electron, Maestro or MasterCard. There are many other ways you can recharge your Postepay card, including at SISAL kiosks, partner tobacco shops, or even if you pay cash to your local postman. You can also reload it by using the Postepay or Postemobile applications, available for free download for iPhones and Android devices. The PosteMobile SIM cards are also synced with your Postepay account, so they can be used for recharging, as well. The service also offers the option of sending and receiving money to and from PayPal accounts. 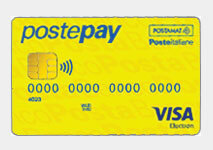 This is the standard and most widely used Postepay card, which allows the service’s customers to hold up to €3,000. This option is convenient for shopping in brick-and-mortar stores and making payments online. Purchasing the plastic Standard Postepay Visa Electron Card costs €5. In addition, there are no processing or annual fees. The minimum reload is €5, while the maximum limit for recharging is €500 per transaction and €1,000 per day. Annually, users can load up to €50,000 across all the cards registered under their name.The maximum daily withdrawal from an ATM is €250, while users can enjoy unlimited monthly withdrawals. With this option, Postepay offers its customers two cards – one of them remains for the account holder, while the second one can be given to another person, as a gift, for instance. The cost is €8 and each of the cards can be loaded up to €999. 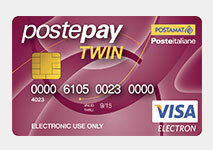 Users of the Twin Postepay can recharge their cards with sums ranging from €1 to €250 per single transaction, or up to €250 each day. The annual maximum limit for reloading is €2,500. The maximum daily and monthly withdrawals are limited to €500 and €1,000, respectively. This a virtual Postepay card, ideal for use online, including in web-based stores and casinos where MasterCard is accepted. The e-Postepay MasterCard can be acquired through online registration at the official site of the service and is free of charge. It can be loaded up to €999 with a minimum recharge limit of €1. The maximum daily limit for recharging this card is €500, or €250 per transaction. Annually, users can load the virtual card with up to €2,500. Aside from these three, there are a few other types of Postepay cards as well. 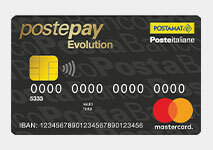 Postepay Evolution and Postepay Evolution Business are both plastic cards by Mastercard. The first one has an issuance cost of €5 and an annual fee of €10. Players need to simply request it from a post office and then they will have the card at their disposal. We say card, but the options that it presents make it seem more like a bank account. In fact, it has an IBAN code of its own. Players can make basically any financial transaction with this card. If this is the only charged Postepay card you have, the maximum amount of funds you can have on it is €100,000. The daily withdrawal limit is €600 while the monthly one is €2,500. As for the second one, the issuance fee is €10 and the annual fee for the first year is €30, and from that point on – €60. However, the ceiling of this card is €200,000. The withdrawal limits are the same as the card described above. Postepay Evolution Business is immediately active when you receive it. If you choose this card, you have a full-fledged Mastercard at your disposal, which means that you can make any purchase in Italy, abroad, and on any of the Mastercard partner websites. Postepay offers other cards as well, however, they are not quite as suitable for online gambling as the ones listed above. Visas are overall more widely accepted as both a method for depositing and withdrawing funds, so you will not encounter any problems with the Standard Postepay Card. Making deposits in online casinos via Postepay is instantaneous and fairly simple. In order to do that, you need to be logged into your online gambling account and visit the Cashier section at your preferred casino. Choose Postepay from the list of available payment options, or if do not see it mentioned, try Visa or MasterCard, depending on the type of pre-paid Postepay card you own. Then, enter the amount of funds you want to deposit into your online casino balance. The web page will redirect you to the Postepay website and you will be required to provide your card information to process the transfer. That will include the Postepay card number and the expiration date, as well as the CVV/CVC security code. The Card Verification Value, or CVV, code is printed immediately after the card account number on the back of the card. When you confirm the transaction, you should see the new deposit appearing in your casino balance immediately. No fees will be charged for deposits through this method. In addition, some online gambling operators offer players reload bonuses when depositing via Postepay. At most casinos, the minimum deposit is €10. Players can withdraw funds from their balance via Postepay by choosing it from the list of withdrawal methods at the casino’s Cashier page. Although most casinos do not feature specifically Postepay as a valid payment method, it is still accepted if you opt for Visa or MasterCard and enter your card details. All you need to take into consideration is the type of Postepay card you have, or, more specifically, its limits. You need to first check what your card’s maximum capacity is before you make a withdrawal as well. That is, of course, if you are a high-roller. For smaller sums you will most likely meet no problems along the way at all. You should also keep in mind that casinos usually have a withdrawal request processing time of about 24 hours. If your withdrawal is more than 5 days late, however, we suggest contacting customer support. Processing withdrawals typically takes 2 to 5 business days to complete. Online casino players will benefit from the lack of processing fees with Postepay. Usually, casinos will not impose charges for deposits and withdrawals via this payment method, which is undeniably a great advantage for all Italy-based players. Choose your online casino wisely to take full advantage of this great feature. Overall, transactions with Postepay cards have insignificant fees that range between €0.30 and €1. For some specific transactions like currency conversions the fees may be higher. The type of Postepay card you possess also matters. Mostly, however, transactions between Postepay users are entirely free of charge and as we already mentioned, casinos usually do not charge Postepay players an additional fee. Along with its simplicity and availability, the Italian pre-paid card service Postepay also provides gamblers with high levels of online protection. This is a very secure payment method because when using it for gambling online, players do not disclose credit/debit card information, bank account information, or any other personal data. Even if your information somehow got into the wrong hands, no one other than you would be able to use it. 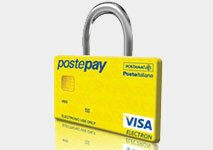 Postepay cards are all fully secured as Visa and Mastercards, with top-of-the-line security protocols in place. One of them is 3D Secure – a protocol, that is XML-based and which was designed to be an additional security layer for credit and debit cards. It does this by adding one more authentication step – the One Time Password (OTP). This is a password that gets sent to your phone number for free and can be used to authenticate one transaction. Postepay’s cards adhere to the latest web security standards and so this OTP feature is entirely free. For Visa users it is known as Verified by Visa and for Mastercard users it is known as Mastercard SecureCode. However, this protocol is not infallible so remain cautious. Players are unlikely to encounter any security problems, as online casinos keep personal data highly encrypted and gaining access to it is virtually impossible. The Postepay website is protected through HTTPs protocol, or TLS encryption, which guarantees that all the personal information you entered to create your account will be kept safe and private. Not to mention that all respectable online casinos have the latest SSL encryption employed on their websites to protect their users’ data. The greatest advantage of Postepay is that it functions like a pre-paid debit card, but it offers much higher security at the same time. When using one of the cards it offers you have the convenience and availability of credit/debit cards, combined with the instant transfers and security of e-wallets. There are no processing fees, while the cost of purchasing a plastic Postepay card is insignificant. Through the Postepay mobile application users can send and receive funds in real time from their phone contacts, as long as they own a Postepay account, as well. The app allows you mobile access to your Postepay account, so you can easily transfer money on the go or customize your account and preferences. You can also use it for transfers to and from PayPal accounts. In addition, Postepay users can always control their spending and monitor all the transfers in their balance even on their mobile device. And despite the fact that there is no specific mention of Postepay on most casino websites, the payment method is still accepted – the issued Postepay cards are under the Visa and MasterCard brands. Another advantage for Postepay users is the use of the feature My Cards. With it, you can customize your card’s functionality and capacities. You can restrict certain features or even disable them, while enabling others and removing restrictions. In fact, you can customize your card for your specific gambling needs. Yet another advantage of using a Postepay card is that you get to renew it for free. All the funds get transferred from your old card to your new one for free as well. You can renew your card online or on the phone number – 800 00 33 22 which is free of charge. Although Postepay can be used online and in stores around the world, it is available only to Italian residents. In fact, you need to be an Italian citizen to create a Postepay account, or you need to work there at least, as the issuer requires an ID and a social security number, alternatively a tax identification number. If you lose your Postepay card, you will have to pay €5. That is not a lot of money but in cases of theft this is not a pleasant thing to have to do. It is quite strange that there is a tax in cases of theft given that you can renew your card for free, as well as deactivate it. The registration of a Postepay account can also take several days in some instances, as the pre-paid card needs to be activated at the service’s official website. Even if that is not the case, the Postepay cards only work with EUR. Postepay is a convenient, fast and secure payment method for Italian online casino players. Deposits are instant and withdrawals take only a few business days, which compared to bank transfers, is just as reliable, but faster. The fees when using this method are very small or non-existent and it is available to anyone in Italy who owns a Postepay account. This service can be used not only for depositing and withdrawing funds from online casinos, but for a vast range of other activities such as paying bills, shopping online, buying mobile phone credits, and many others. It comes with a great deal of features you do not usually have access to as a Visa or Mastercard user. Not only that but they are also entirely free. Players can enjoy great advantages with Postepay. If you can get a Postepay card, we highly recommend doing it.